A Saturday sports title which is going online only produced a special souvenir edition to mark its final time in print. 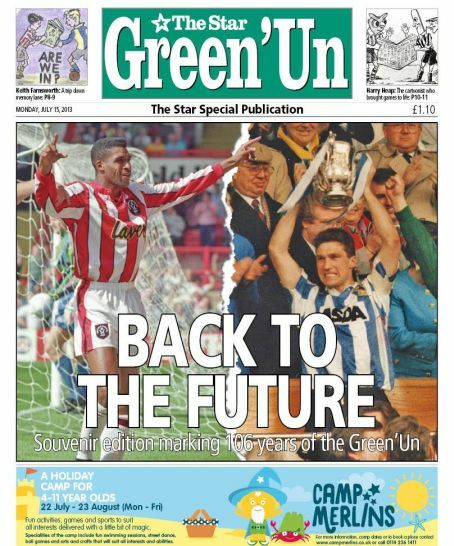 The Sheffield Star’s Green ‘Un title was published in print for the last time on Saturday after 106 years but is now set for an online relaunch. Its closure was announced to staff and readers earlier this month and the National Union of Journalists called for a full investigation about whether the Johnston Press title could be retained as a printed product. The Green ‘Un was one of the last remaining Saturday sports titles still to be published amid a series of closures in recent years, including at Portsmouth’s The News, where its sports edition was closed last October. The Sheffield title’s final printed edition was a special souvenir publication, pictured below, to mark its 106 years of sports coverage and looks back at some of the most memorable moments in the region’s sporting history. Star editor Jeremy Clifford said: “It is always sad to see the day when you cease printing a newspaper. But The Green ‘Un’s name and future has been secured by moving it to a digital-only format. In fact, it will actually bring the title to life during the week as well, rather than just being a Saturday evening publication. “It already has a good Twitter following @StarGreenUn, and now we will be updating it during the week, too. The paper has told readers that its new online version, which will be launched at the start of the football season, will allow it to become more immediate and responsive to sports news. It said Green ‘Un content would now be available on The Star’s website for the first time and the paper’s football app would be getting a Green ‘Un makeover. In a story about the final edition, the title said: “Next season the Green’Un points the way ahead after its long and distinguished history in print form. “It will cease as a newspaper in the traditional sense but will reappear as a vibrant force online. “Followers of the Blades, Owls, Rovers, Reds, Millers and Spireites will still be able to read bang up to the minute match reports of their team on Saturdays complete with pictures. The new online version will keep the same features as in the printed Green ‘Un and also add new content, including more nostalgia. The problem is, what was once unique and cherished is now one of a slew of websites competing for the same audience. Yes, there may be some exclusivity and energy to the Star’s online service, but there’s nothing intrinsically special about it. Add to this, the real gold in sports papers was the ultra local stuff, your pigeons, swimming, local football, hockey etc etc. This stuff does not translate well to online. I was there when we axed the Sportsmail at Hull. It probably had to be done, but the coverage of local sport from then on dropped alarmingly.